2013 FAIR Conference Report…Sort of: Actually, this is Going to be About ME! I am too lazy to do an actual write up on the FAIR Conference, so I’ll just refer you to Blair Hodges summaries of the talks on the Maxwell Institute Blog. John Gee also has a brief report. The FAIR Blog has also reported on important news from the Conference. Instead, I want to focus just a little bit on the part of the FAIR Conference that was all about me. That is right – a small, teeny-tiny part of the conference was about ME! 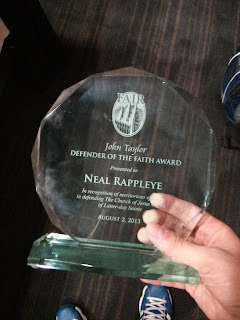 This year I was awarded the 2013 John Taylor Defender of the Faith Award for a project I helped develop with Hales Swift called the FAIR Study Aids. (Hales was also given the award, but could not attend.) While receiving the award, I was asked to say a few words, and frankly ended up looking like an idiot. (That is okay, though, because as Robert Kirby informed all of us on Thursday, I am an idiot.) Now, generally I am a pretty good public speaker, even when put on the spot, but this time around my mind blanked and I just stuttered and stammered, and said a few things that didn’t really make much sense. I was glad to be able to correct some things and clarify a few of my thoughts to some in private conversations, but I imagine most people just left thinking, “Gee, why did that moron get an award?” (A fair question, in all reality, even if I had given a more impressive speech.) In any event, I offer here what I should have said, which anyone who was there can assure you has virtually no overlap with what was actually said at all. But, I am hoping that we can all agree to just pretend like this is what was said, and that future historians who write about that moment (since we all know it will go down in history as a pretty big deal!) will just put this in as if it were my actual speech. I am literally speechless, which is quite frankly rather rare – just ask my wife. It is truly an honor and privilege to be given this award today. It would be remiss, however, to not offer a few thanks to people who made it possible. First, I should say something of my partner-in-crime, Hales Swift. It is unfortunate, if you ask me, that Hales couldn’t be here to bask in the limelight, because he really deserved this a lot more than I did. It was his idea, and though I helped get things off the ground, and continue to stay involved, he really has been the driving force behind it this whole time. I would go to add some more articles only to be shocked at how much more Hales had done to add to it and improve it since the last time I had worked on it. Hales really deserves the lion’s share of the credit. 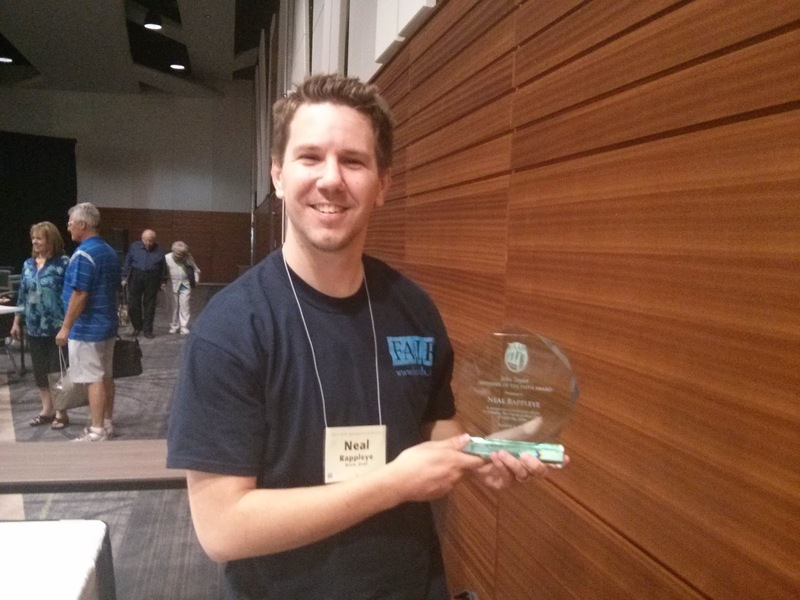 Me holding my trophy after the conference. I would also like to briefly mention James Stutz, another FAIR volunteer who helped with an early incarnation of the Study Aids where we attempted to organize materials by Gospel Doctrine lesson. He and I eventually got behind and burned out on that, but he put in some solid work that deserves some level of recognition. Second, my wife McKall deserves to be thanked and given some recognition, because all the effort and time I put into this is her sacrifice as much as it is mine. In fact, in some ways it is more of a sacrifice on her part, because while I get to do things I enjoy and be involved in something that is important to me, she just gets a husband who is often busy and distracted. And yet, she has supported me and encouraged me every step of the way. She incredible, and I love her very much. It has my name engraved and everything! Also, if you would like to benefit from this project, aside from going to the Study Aids section of the Wiki, you can also join our Facebook page, FAIR LDS Scripture Study Aids. 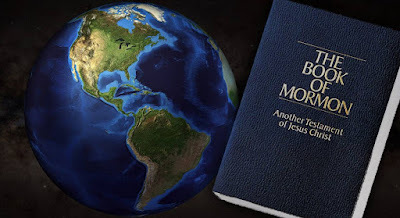 There you will receive updates (new articles) regularly, and see feature articles and videos that will enhance your study of the scriptures. Again, I would just like to thank everyone, including Scott Gordon, John Lynch, and others at FAIR for giving me the opportunity to help, and say that I look forward to continuing to help in whatever ways I can. Thank you. 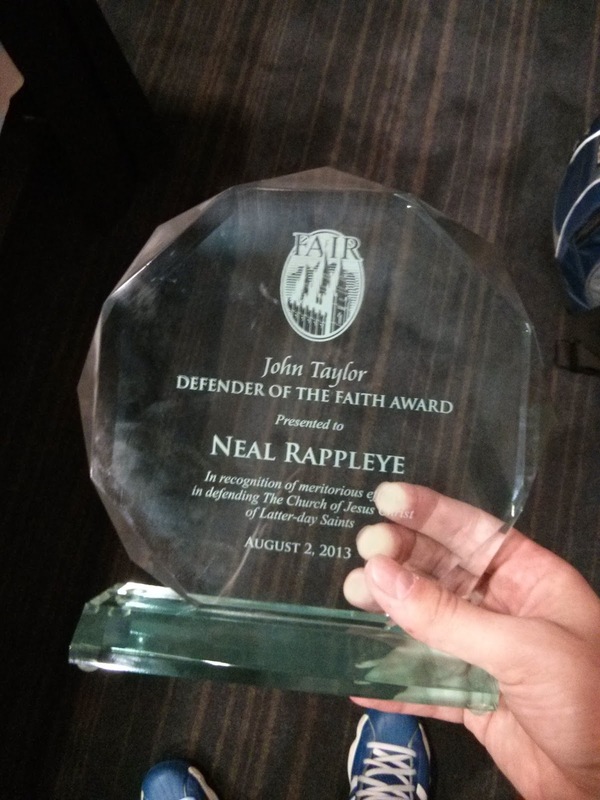 Congratulations, Neal! It was nice meeting you on Thursday at the conference. Thank you, Nathaniel, it was likewise a pleasure to meet you. I hope we have many other opportunities to get know each other better. When did this award's ceremony occur? Did you know ahead of time that you were receiving it? And if so, you didn't invite your parents to come and witness this great occasion? Even so, I'm proud of you and wish we could have been there. I love you too!